Sounders owner Adrian Hanauer, the sons of former Sonics owner Barry Ackerley and the boss of Amazon Web Services are among the minority owners of Seattle’s proposed team. Joining the Seattle Hockey Partners ownership group for the planned 2020 debut of the NHL expansion franchise were a couple of last names familiar to Seattle sports fans: Ackerley and Hanauer. Sounders owner Adrian Hanauer, along with twin brothers Chris and Ted Ackerley, sons of former Sonics owner Barry Ackerley, were among seven local business executives added Wednesday as local principal owners in a group headed by Los Angeles-area majority owner David Bonderman and partner Jerry Bruckheimer. The group will be part of a presentation Oct. 2 to the executive committee of the NHL Board of Governors, where the award of an expansion franchise will be formally considered. If approved, the project will advance to the full board at a December meeting. Oak View Group, headed by Tim Leiweke, is re-developing KeyArena with more than $700 million in private funds. The group hopes to begin demolition in October to meet an aggressive timetable that concludes with the opening of the NHL season in 2020. “It is with great pride that we welcome these local investors and their families to our group as we strive to secure an NHL franchise,” said Tod Leiweke, president and CEO of Seattle Hockey Partners and a former Seahawks CEO, in a release ahead of a press conference. David Wright, head of Grousement Associates real estate development firm and a board member of the Space Needle Corp., was named vice chairman of Hockey Partners. Joining him is brother Jeffrey Wright, who are two of the five children of Howard S. Wright, who helped develop the Space Needle for the 1962 Seattle World’s Fair. Andy Jassy, who joined Amazon in 1997 and has been Amazon Web Services president since 2016, brings the clout of Seattle’s most influential company. According to Geekwire, AWS, the market leader in cloud computing, generated $6.1 billion in revenues last quarter. Jassy, a big New York sports fan who built a sports bar in his home, in 2016 was Amazon’s highest paid employee at $35.6 million, according to Fortune magazine. 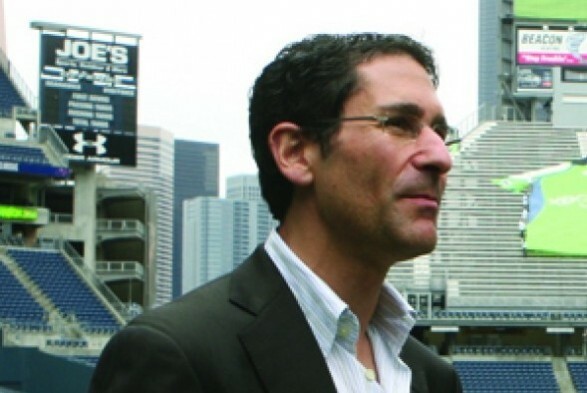 Jay Deutsch, founder of Seattle-based Bensussen Deutsch & Associates that has worked with the Seahawks marketing since 1984, rounds out the group. Tim Leiweke, leader of Oak View Group, which is redeveloping KeyArena for concerts and the NHL, was joined Wednesday at the press conference by Seattle Mayor Jenny Durkan to announce three agreements reached between the city and the developers, who have pledged at least $700 million in private funds to the project. The documents — a development agreement for the new arena, a long-term ease agreement and an integration agreement — were released to the public and Seattle City Council. Majority owner Bonderman, an investment banker who graduated from the University of Washington, said, “After long and detailed negotiations with the city we are pleased that these agreements, critical to redevelopment of the new Seattle Center Arena, are moving forward to the City Council for consideration. Lose a basketball team because Howie sold out for $350 million. Spend over a billion a decade later, get a hockey team. Well done everyone. Almost two billion including the arena. Hey, it started with your willingness to spend $5 for a cup of coffee. That, and Steve Ballmer forking over a couple billion for the Buffalo Braves. Some thresholds should not be crossed. By 2025 and another $2B, you’ll have an NBA team. Just like that. Another move that solidifies the NHL Seattle group and their efforts. Chris Hansen has stated he has no interest in the NHL but that might have been a mistake on his part. If he was a minority owner he’d have a say in all this. As it is hockey has been the topic of conversation for awhile now and the NBA has had no movement in regards to returning. With the Ackerley’s and Adrian Hanauer coming on this is a group that knows the world of professional sports and has secure financial footing. Hansen had no passion for hockey. He worked as hard as did for his passion. But, the NBA bid was just as financially secure. It just didn’t have any civic or political backing. And, don’t sell Hansen short regarding his willingness to add the NHL to his group’s proposal, if reports of him and the former owner of the Chicago Wolves (whose name escapes me now that Hansen has faded from view) negotiating behind the scenes were true. Any idea of the minority percentages? Nothing yet, but if Hanauer’s in, it’s small stuff. Can any one of them explain icing to me? If the team controlling the puck dumps it beyond the opposing team’s goal line – from behind their own red line – icing is called. It’s a face-off back in their own zone and no line change is allowed. Icing is waived if the team is killing a penalty. Look at you, Gordie Howe. Start with soccer offsides and work back.